Here is this week's statewide football poll, as voted on by the members of ESPN NH's Friday Nights and Nashua Telegraph sports dept. Not much movement among the top 10 teams this week. Exeter is still #1, but not everyone has them there! 1) Bedford - They were a preseason consensus top 5 team, they they beat the preseason #1 team Pinkerton in week 1 which gave them the #1 spot on my ballot last week. Then last weekend they beat West 61-0, so no reason to move them down. 2) Exeter - I had them #2 last week, then on Saturday night they went on the road and beat a very good Keene team 13-3. Bedford over Pinkerton and Exeter over Keene are the 2 most impressive wins of the season in D-I, so it's no surprise they're the top 2 teams right now. 3) Concord - These guys are definitely for real. Both Concord and South are 2-0 with wins over non top 10 teams, but Concord gets the nod as their 35-6 week 1 win over Central is the more impressive win between the 2 teams. 4) Nashua South - South showed last week that even without star QB Trevor Knight in the lineup they can still light up the scoreboard, as they trounced Alvirne 35-0. 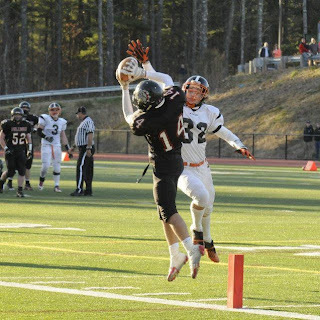 5) Pinkerton - After a slow start vs. Central the Astros got better as the game went on to win 37-20. They get the slight nod for the #5 spot over Keene on my ballot, because even though both teams are 1-1 Pinkerton lost by just 2 on the road whereas Keene lost by 10 at home. 6) Keene - See above for reasoning on why I have Pinkerton ranked ahead of Keene. As for why I have Keene (1-1) ahead of Winnacunnet (2-0), look at common opponents. Both teams defeated Nashua North. However Keene demolished the Titans 34-0, while Winnacunnet only beat them 20-17. 7) Winnacunnet - Big game this week vs. Exeter. NH Notebook will have it covered. 8) Trinity - Trinity gets the slight nod over Plymouth for the #8 spot on my ballot. Both teams are 2-0 wins with both wins being by 2 scores or more. But Trinity is the only one of the two teams with a win over a previously ranked opponent, as Portsmouth was ranked in the preseason. That win is enough to give the Pioneers the slight nod, although props should also be given to Plymouth for their 41-7 drubbing last weekend over Windham. 9) Plymouth - Speaking of big games, how about Plymouth @ Trinity in week 4? It's still early, but that is looking like a championship preview in D-II. 10) Bishop Guertin - They just barely lost to #7 ranked Winnacunnet in week 1, and they blew out Dover last week. BG is a solid pick for the #10 spot.